Speech by Steven Ganci during the Ven. Nyanavira Thera Memorial Day, Bundala, Sri Lanka, 26th February 2016. Well, it’s a great pleasure to be here with all of you today (including the kabargoya [monitor lizard] and all the other creatures in this peaceful place). Though many of us are relative strangers to one another we gather as friends with a wholesome intention. 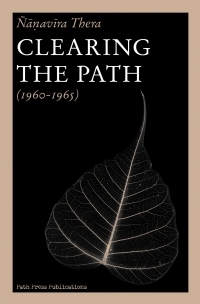 Clearing the Path (1960-1965) by Ñāṇavīra Thera. Path Press Publications 2010, 621 pages.